Please note, this piece contains adult language. Spending Shabbat in a foreign place has always intrigued me. While studying abroad in London and then backpacking for five weeks around Europe in the late ‘90s, I felt a strong pull to be in a synagogue on Friday night. I must admit, this draw was never particularly tied to observing the Sabbath. 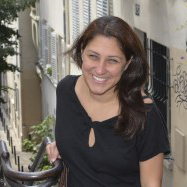 But rather it was rooted in my strong love of European Jewish history, my need to feel a connection to home, and, quite honestly, my desire to balance the countless beautiful churches I was touring, climbing to the top of, and snapping pictures of on my trek. It was a whole lot of churches. During that time, I spent Friday nights in synagogues in London, Amsterdam, Prague, Budapest, Florence, and Copenhagen. In some places, I lingered and met community members and even stayed for a festive Shabbat meal in Copenhagen. Those Erev Shabbats are very special memories for me and I feel so fortunate that I was able to have those experiences. Yet in all those travels I never attended services in Germany, let alone in the heart of what was once the Third Reich, Berlin. Until now. This past Friday evening, I had the privilege to be welcomed at the Pestalozzi Street Synagogue – the last classic German liberal synagogue. I was with 90 teachers from 18 different countries, accompanying our group from Newark on the Centropa Summer Academy on an eight-day intensive study of 20th-century history, the Holocaust, and civil society in Berlin. Last year, I had gone with the same group to a synagogue in Budapest and had really enjoyed the experience. So, as I shook off my jet lag, I was looking forward to a similar Shabbat experience to those I had had around Europe. In some ways, it was very much the same. The synagogue itself was one of the most beautiful I had ever seen. The rabbi, cantor, and congregation were kind and friendly, and seemed genuinely happy to have us there. There were more familiar prayers and traditions than unfamiliar ones, and I was happy to help the non-Jewish teachers traveling with me better understand the service. What I wasn’t prepared for, however, were my own emotions. At first, I wasn’t quite sure why I felt so emotional. But as the rabbi delivered his sermon in German and I sang Oseh Shalom along with young German Jews that are growing up today in Berlin, tears stung my eyes. What I originally interpreted as unease at hearing the German language – and from a rabbi on Shabbat no less—revealed itself as actually an overwhelming sense of triumph. Many of the European synagogues that I had prayed in were in extremely diminished Jewish communities and had dwindled to only a few members. Most of them existed more for tourists than for their own congregations. And while I felt a sense of pride worshipping in those synagogues, I never truly felt like my presence held any real importance. But last Friday, in the heart of Berlin at this overwhelming beautiful service that echoed generations past, something felt different. And for a lack of any other way to say this, I began to feel like I was partaking in a big f*** you to Hitler and the Nazis. We have not even passed the century mark since the end of the Holocaust and the Jewish community of Berlin is strong again; worshiping in the same place and in the same way that they had before Hitler ever came to power. And there we were – Jewish and non-Jewish educators from all ends of the world coming together to witness it, learn about it, and then go back and teach it. How amazing is that?! 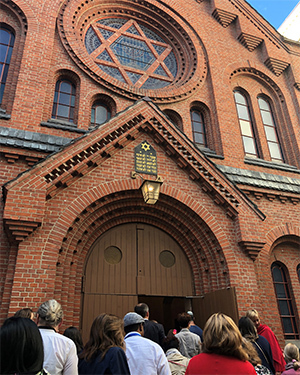 Gulping back those tears, and through an enormous smile, I couldn’t be more proud to welcome in the Sabbath in a beautiful, over-100-year-old synagogue, led by a German rabbi and cantor with their thick German accents.